Mike Kerry and Chris Hall, The Ballad of Mott the Hoople, 2010, black-and-white and color film in 35 mm, 103 minutes. 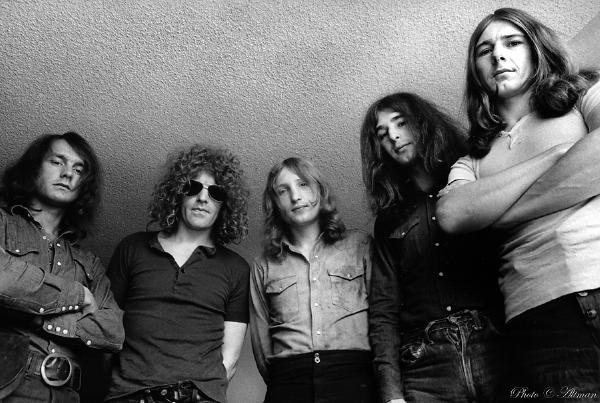 NAMED AFTER AN OBSCURE NOVEL by Willard Manus about a circus freak, Mott the Hoople were one of the emblematic rock bands of the early 1970s, their many stylistic phases—hard rock, singer-songwriter, country rock, glam—paralleling the genre shifts of the period. Like the Velvet Underground and the Stooges, Mott were a cult band before the category existed, and like Lou and Iggy, they enjoyed a midcareer resuscitation from the original fan–rock star, David Bowie. Originally a semimanufactured group consisting of four yobs from Herefordshire and a minor genius from Northampton, Mott were put together and named by legendary DJ and impresario Guy Stevens, a Phil Spector–level nutter with a healthy appetite for drugs and a reputation for studio mayhem. (Incredibly, Stevens had already formed and named Procul Harum, perhaps the second oddest band name in rock history.) Stevens ran the Sue imprint for Island Records, bringing American R&B to British shores under the auspices of a label then known for Jamaican music, and he wanted to create a band that would meld Bob Dylan and the Rolling Stones. Enter the inappropriately named Silence (the four yobs), who were essentially signed to Island on the basis of the gumption they showed in lugging a massive Hammond organ up the studio stairs. At the time, they were fronted by a singer who, according to Stevens, didn’t have the right look, so he was demoted to tour manager. Ads were placed for a singer–piano player, and Ian Hunter (the minor genius), who resembles a better-looking, ginger-haired Howard Stern, was auditioned and hired without great enthusiasm, almost as a stopgap. He turned out to be a good investment, quickly developing as a strong songwriter and charismatic frontman, equally at home in four-on-the-floor rockers and dark, emotive piano ballads. A limited but affecting vocalist, Hunter made good on Stevens’s dream of a Dylan/Stones amalgam. Along with labelmates Free, Mott were early purveyors of cowbell rock—heavy, boogie-ish material with titles like “Rock & Roll Queen”—but they displayed a level of energy, eccentricity, and (occasionally) intelligence that set them apart from their peers. They soon became known as a reckless, exhilarating live act—making ardent fans out of Bowie, the nascent Queen, Mick Jones (later of the Clash), and Morrissey, among others—but record sales eluded them for their first four LPs. In 1972, after playing a desultory gig in a repurposed gas holder in Switzerland, they decided to split. Bassist Pete Overend Watts (the other yobs also had great names—Mick Ralphs, Verden “Phally” Allen, Dale “Buffin” Griffin) auditioned for Bowie, and on hearing the news, the glam princeling flatly told Watts that Mott couldn’t break up. He offered them “Suffragette City,” slotted for his yet to be released Ziggy Stardust album, but they turned it down. Bowie then wrote a song specifically for Mott, which they instantly knew would be a hit. The song was “All the Young Dudes,” one of the key, genre-defining glam rock tracks. Mott enlisted Bowie as the producer of their next LP, signed with his management, defected to Columbia Records, and purchased truckloads of cosmetics and outrageous platform boots. The song went to #3 on the UK charts, and Mott entered the phase for which they’re best remembered. Despite the success, Allen and then Ralphs left the band. Mott replaced them with maniac guitarist Luther Grosvenor—formerly of Spooky Tooth, he was dubbed “Ariel Bender” after an inside joke about vandalizing car antennae—and pianist Morgan Fisher, who contributed to Mott’s Liberace-on-LSD look of the period with candelabras and absurd keyboard-themed suits. Two glam-influenced, career-peak albums followed, self-produced by a newly Svengali-free band, with singles “All the Way from Memphis,” “Roll Away the Stone,” “The Golden Age of Rock ’n’ Roll,” and “(Do You Remember the) Saturday Gigs” keeping them in the charts and on the road. On the eve of their biggest American tour, with Bowie’s ex-guitarist-arranger Mick Ronson in tow, Hunter fell ill from exhaustion; gigs were postponed, then canceled; and Mott the Hoople ceased to be. Brit filmmakers Chris Hall and Mike Kerry, whose previous documentary Love Story (2008) celebrated one of the other original cult bands, bring a similar fan’s ardor to the ballad of Mott, tracking down all the relevant people and blending raucous vintage performance footage with present-day, talking-head reminiscence. The yobs now look like schlumpy pensioners, while Hunter is relatively well preserved. All of the members are as personable and unpretentious as they were in their heyday; indeed, it’s hard to imagine even uninitiated viewers coming away from the film without great affection for the band. Picture Todd Haynes’s Velvet Goldmine (1998) getting mugged by This Is Spinal Tap (1984), and you have some idea of the resulting tableau. Wildly entertaining and all true. Carry the news. The Ballad of Mott the Hoople is now available on DVD.